This post is from Domenica DiPiazza, editorial director of Twenty-First Century Books. It’s a book libraries will want to have during a time when youth interest in and awareness of war is high. The book is informative, deeply researched, and emotionally stirring. 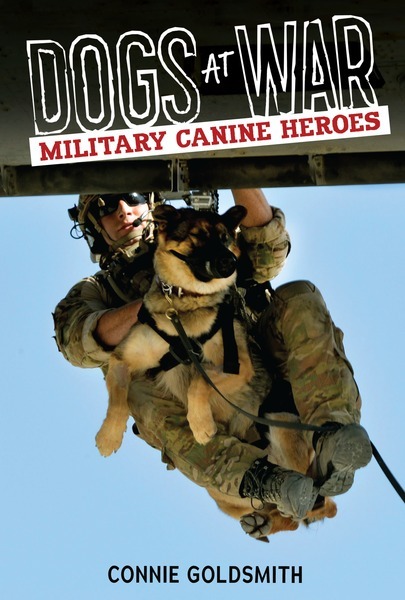 It describes the contributions working dogs make not only to the battlefield but to civilian life. We meet soldiers, families, and experts in the field and come to love the dogs who work so faithfully in the toughest of circumstances. Part of what makes canines such a natural working helpmate is their intensely keen olfactory system. Goldsmith writes about this in her book, as does Alexandra Horowitz in her new adult bestseller Being a Dog: Following the Dog into a World of Smell (Scribner, 2016). Horowitz runs the Dog Cognition Lab at Barnard College in New York. She gave a great radio interview recently on Fresh Air. For those of you with dogs, you’ll be inspired to take your dog for a “smell walk” to experience the world from a dog’s point of view. And you’ll be ready to order Dogs at War!